« March 17, 2017 – Brian Will Be Performing At Ponte Winery In Temecula! 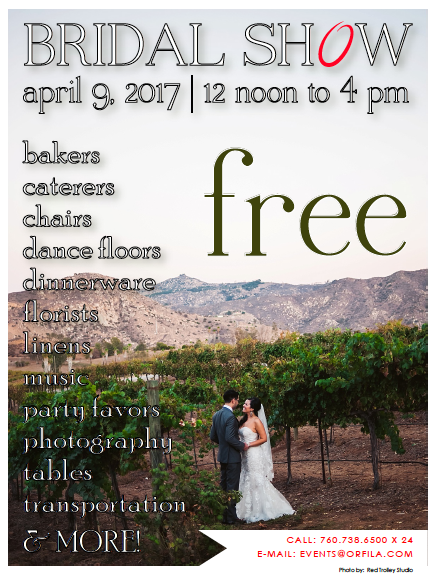 April 9, 2017 – Brian Will Be At The Orfila Vineyards & Winery Bridal Show! Brian will be at the Orfila Vineyards & Winery Bridal Show this Sunday, April 9th, from 12:00pm to 4:00pm! Head on out and join him!! Tagged bridal show, http://www.orfila.com, orfila, sunday bridal shows, winery bridal, winery bridal fairs. Bookmark the permalink.